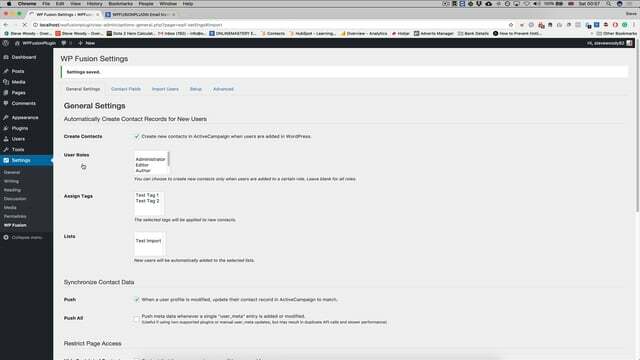 WP Fusion includes an import tool that allows you to import existing contacts from your CRM as new WordPress users. If the password field is selected for sync on the Contact Fields tab, existing passwords can be imported as well. If the password field isn’t selected, a secure password will be automatically generated. If you check the box next to Enable Notifications, WordPress will send a simple welcome email to the user with their username, and a link to log in on your website. You can customize this welcome email by using a plugin like SB Welcome Email Editor. If you’re using a membership plugin like Ultimate Member, the plugin may send out its own welcome emails to new users, in which case you should leave Enable Notifications disabled. You can also leave email notifications disabled and send the user’s password back to your CRM after import. Check the box next to Return Password on the main WP Fusion settings tab, and select a field in your CRM in which to store the generated passwords. After each user is imported, their automatically generated password will now be saved back to their contact record, and you can use a merge field to include it in an email. The username will be the contact’s email address. Note: Before importing a large number of users, first do a test import on your own contact record to ensure that all of the information is imported and the welcome emails are sent correctly. By default WordPress will send a notification email to the site owner for every user imported. If you’re importing a large number of users you may wish to temporarily disable this using the Disable New User Notification Emails plugin.